Fed up with Thatcherite and New Labour politics, Scots have grown farther apart from their southern neighbors. Inverkeithing is one of those places that make Scotland seem like a country with more history than future. First the coal mines shut down, then the paper mill, and finally the shipbreakers—the HMS Dreadnought and the ocean liner Britannic were both taken apart at the yard here. Mike Ryan’s father died in a mine cave-in; he’s seen his own employers sold twice. But what brings Ryan and about forty other men and women to the whitewashed crypt of a former Franciscan friary on a warm summer evening isn’t the past. This is an “Imagine Scotland Cafe”—aimed at persuading undecided voters to vote Yes in the September 18 referendum. Anxiety about how Scotland would fare on its own is a common theme among No supporters—though more often expressed in terms of economics than national security. Would the Royal Bank of Scotland—which got a £46 billion bailout from the British taxpayer in 2008—have survived? Can a small country generate the jobs, and the exports, needed to prosper in the global economy? Nor is Torrance sympathetic to the view that only the dead hand of London-centered rule keeps Scotland from becoming a Scandinavian-style social democracy. “All the tools required to decrease inequality—taxation, property tax, education, welfare provision—already exist,” says Torrance, pointing out that the Scottish Parliament currently controls spending on health and education, and that Labour and the Tories have both pledged greater devolution if the referendum fails. “If we start by asking whether we’ll be £50 better or worse off after independence, then we’ll create a country that’s about being £50 better off,” he says. Instead, the people there discuss wanting a country that relies less on coal and oil for energy (Scotland already generates half of Britain’s wind power), offers its children good jobs as well as a good education, ditches the Trident nuclear missile system and keeps the National Health Service (NHS) publicly owned. When Tony Blair offered Scotland devolution in 1997, the aim was to make outright independence unnecessary. “Devolution has allowed us to protect the NHS in Scotland while it’s been privatized one piece at a time in the south,” a woman says. In Scotland, I am reminded, personal care for the elderly is free—as are Scottish universities. Labour leader Ed Miliband might promise to abolish the bedroom tax—the hated Tory policy of cutting housing benefits to tenants deemed to have “spare” room—but in Scotland it never took effect. The 1707 Act of Union made Scotland part of Great Britain; for the next three centuries, independence remained a lost cause. Indeed, the defeated American Confederacy borrowed its own “lost cause” mythology from Walter Scott’s romantic tales of chivalry. In eighteenth-century Scotland, the Jacobite supporters of the deposed Catholic Stuarts—mainly in the Highlands, along with a few wealthy Anglican or Catholic families on the borders—twice failed to rally their devoutly Presbyterian Lowlands countrymen, and by the nineteenth century Scots of all persuasions were among the most ardent enlistees in the British Empire. Glasgow built the ships, Edinburgh banked the money and the Highland clearances—which pushed huge numbers off the land to be replaced by sheep or deer—furnished the manpower. Even today “you can never ignore the sectarian element in Scottish politics,” says my friend Ajay Close. A Sheffield, England–born novelist who calls herself “Scottish by formation,” Close, like all immigrants, regardless of when they arrived, has a vote in the referendum. 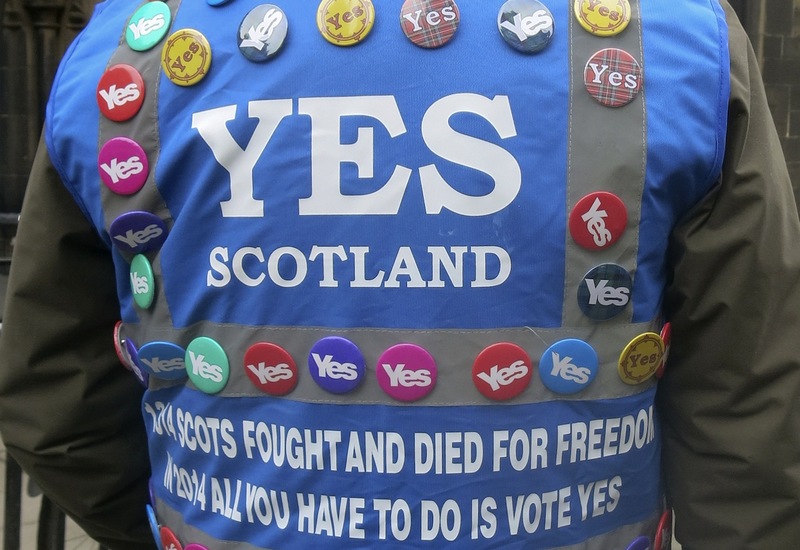 Scots who live in England—and who might be more sympathetic to remaining in the Union—do not. Though that has caused some resentment abroad, the idea of nonethnic nationalism—of a Scotland that belongs to whoever chooses to live there—is widely popular. Still, supporters of the Rangers (the Glasgow soccer team traditionally associated with the city’s Protestant elite) remain more likely to vote No, while fans of Celtic, with its base in the Irish immigrant community, lean toward Yes. But the end of empire meant goodbye to all that. Glasgow’s population peaked in 1939. From the 1950s through the 1970s, block after block of the city was demolished to try to stop the blight, and though recent years have seen considerable cultural regeneration, Glaswegians still have the shortest life expectancy in the United Kingdom. Mike Haggerty is a Glasgow native, an official of the World Curling Association, a man who can still remember “when Celtic supporters had their throats cut”—and when the Scottish National Party were a small band of eccentrics derided as “Tartan Tories.” What changed things? Margaret Thatcher. “She made the Tories toxic in Scotland,” says Haggerty. Thatcher’s assault on the welfare state gave Labour a near monopoly on Scottish seats in Westminster, while lending Scottish nationalism a new—and much wider—appeal. Talk with Yes voters and you hear two stories. One is about political divergence. “While we were electing fewer and fewer Tories, they were electing more and more,” the writer and activist Ellen Galford told me. “Then in 1997, when Labour finally got in, we got Blair,” whose neoliberal project left plenty of room on the left—which in Scotland was promptly occupied by the SNP. “I’ve never been involved in politics,” says Haggerty, adding, “Though I’m still undecided, I’m minded to vote Yes.” Asked why, his first response is “thrawn“—a Scottish word my dictionary says means “perverse” or “crooked,” but which he uses to signify a kind of quiet pride. “It isn’t outward. It isn’t belligerent,” he says. Which is just how Alex Salmond wants it. For all his faults—a slippery manner, a famous temper and a weird bromance with Rupert Murdoch—Salmond is the most talented British politician of his generation. It was the SNP’s surprise victory in 2011 that triggered the current referendum. Salmond then bounced David Cameron into agreeing to a vote in the same year Scotland celebrates the 700th anniversary of Bannockburn, when Robert the Bruce led a small Scottish army to victory over the British. Imagine Abraham Lincoln telling Jefferson Davis that the South—and only the South—can vote on whether to leave the Union. As a British citizen and a Labour Party member, I’d hate to see Scotland go. The short-term effect on British politics is uncertain: without Scotland’s forty-one Labour MPs, the Tories would have an outright majority, but if Scotland departs on his watch, Cameron is unlikely to survive as prime minister. However, the loss of Scotland would also remove a significant counterweight to the xenophobic “Little England” nationalism behind the UK Independence Party, making a British exit from Europe more likely. What remains—“rUK,” as they already call it in the Scottish papers, with the “r” standing for either “rest of” or “rump”—would be in every way a lesser country. And though the Scots seem committed to an inclusive, open vision of nationalism—a nationalism without blood—it would be nice to think that other forms of solidarity, whether based on class unity or shared history, were just as important. But if I were Scottish, I can’t imagine not voting for independence. Not just for the chance to scrap Trident—an early, and hugely popular, SNP promise. And not just for the chance to build a Norwegian-style petro welfare state. Spend more than a few days in Scotland and you quickly realize that the country already has its own culture. Does it need its own government as well? Novelist William McIlvanney—Hugh’s brother—once said the Scots were like refugees in “our own country. We are almost seven hundred years old, and we are still wondering what we will be when we grow up.” They may be about to find out.